[Stride]-Stride Step-[Choose one or more cards with the sum of their grades being 3 or greater from your hand, and discard them] Stride this card on your (VC) from face down. 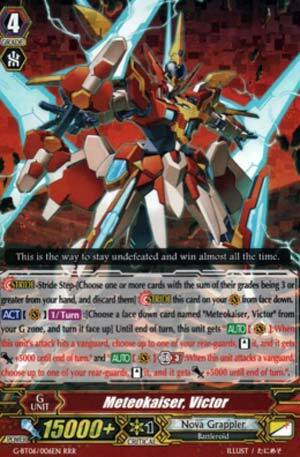 [ACT](VC)[1/Turn]:[Choose a face down card named "Meteokaiser, Victor" from your G zone, and turn it face up] Until end of turn, this unit gets "[AUTO](VC):When this unit's attack hits a vanguard, choose up to one of your rear-guards, [Stand] it, and it gets [Power]+5000 until end of turn." and "[AUTO](VC) Generation Break 3:When this unit attacks a vanguard, choose up to one of your rear-guards, [Stand] it, and it gets [Power]+5000 until end of turn.". So yes, this happened. We're about to receive our latest shiny shinies and so what better way to start reviewing interesting things again with the new G-Units of G BT06? Meteokaiser Victor has an ACT skill that requires a G Persona Blast, but once that's done, he get's Vic-Ten's skill to restand a rear-guard and give it 5k power when Victor hits the Vanguard, and another GB3 skill that stands a rear-guard and grants 5k on attack too. Digressing for a moment: I read the flavour text and wondered how someone can be undefeated if they only "almost" always win. Then someone said a draw could happen and I was like "ah, you got me." Basically supposed to be used as a second Stride, unless you need Regular Victor's GB2 for some reason and Vic-Ten alone won't cut it for you. So assuming all conditions like GB3 are now fulfilled, what does this mean? Well, you are in all likelihood combining this with base Victor, so what you have is Vic-Ten restanding an entire column and making it 10k stronger, with the possibility of another rear-guard swinging in should the opponent fail to guard. Still not a fan of this however as it's only as good as the board it can keep, so Control decks make it unhappy, but assuming a fight against everyone else this is pretty good. It's just not quite as good as Victoplasma unless you completely devoured all of your counterblasts. It's also not as good as Lambros. There I said it. Oh look, Nova Grappler Stride. Persona Flip and On-hit, restand one of your rear-guards and give it +5000 and if at GB3 do it on attack. So, if you hit, do both. Very simple, very nice, very Nova Grappler. More attacks means more pressure which means more chances to murder your opponent.